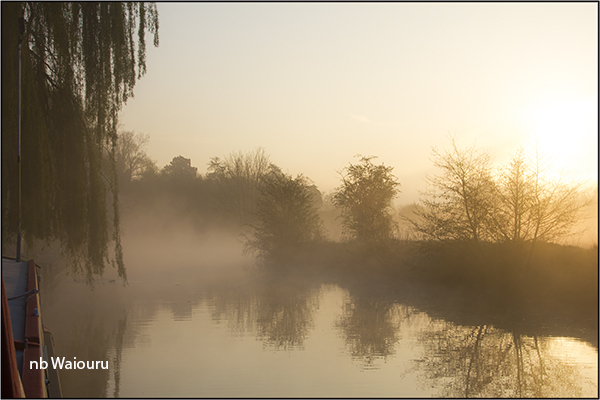 A very misty and crisp start to the day. The weather forecast for the weekend isn’t that great so it’s probably time to move. A quick trip to Tesco restocked the cupboards in the galley. Whilst there Jan noticed a joint roll of gammon on special and decided to buy it for dinner tonight. We were about to depart our mooring when I noticed some activity in the lock behind us. A lady was beckoning me so I walked down to find out what was happening. The three ladies around the lock were off a hotel boat that was stuck attempting to exit the lock through the lower gates. Both gates hadn’t fully opened and the steerer had managed to wedge the boat in the opening. The crew had been unsuccessfully attempting to free the boat by trying to remove the obstruction between the gate and the lock wall. After watching for several minutes I suggested they open both top paddles to let more water into the lock whilst simultaneously putting the boat into full reverse. This worked! The crew were then able to remove the log from behind one gate which allowed the boat to exit the lock with an inch to spare. We then headed off in the opposite direction stopping at Harlow Mill Lock to top up the water tank. Good pressure from the tap meant it was a brief stop. 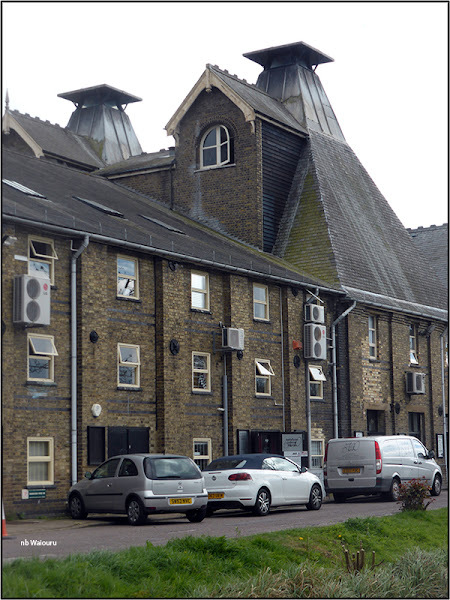 There are new residential apartments on the offside at Sheering Mill Lock. They look rather attractive except there are no garages. It appears to be one of those developments that gives the appearance of embracing boats when they really want them to stay away. 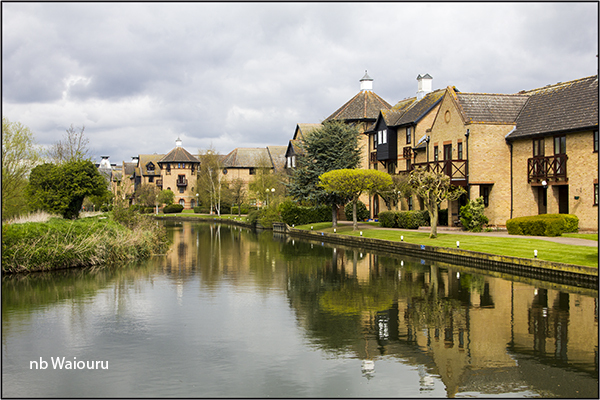 The development surrounds an old canal basin which has finger moorings, but no boats. The bank has well maintained mooring bollards but ‘No Mooring’ signs. Glimpse of the basin and vacant finger moorings. Today the route of the river has been twisting and winding with a number of sharp bends. Perhaps we have been fortunate that there are few boats on the move. At this point we were on the southern outskirts of Sawbridgeworth. 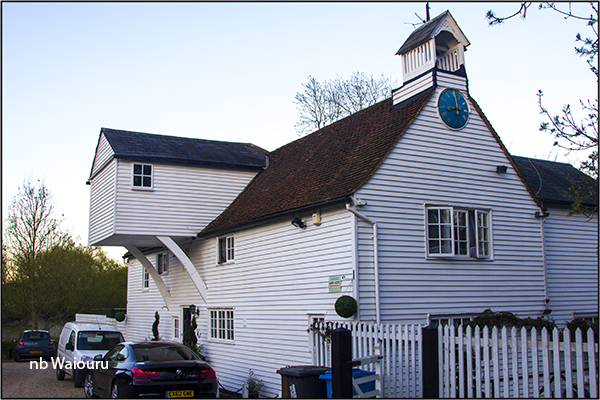 A former malt kiln has been converted and now is a centre for a variety of small businesses. 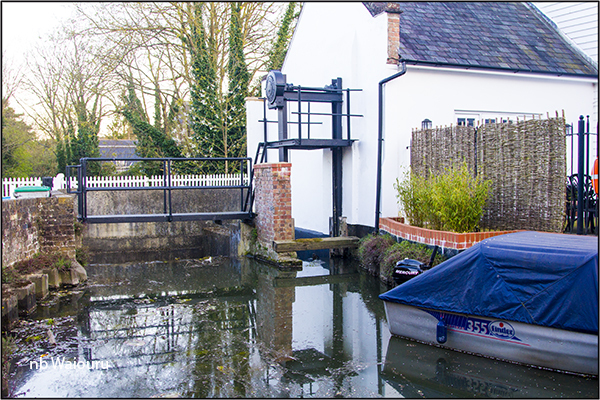 The last lock for the day was Sawbridgeworth Lock on the northern edge of the village. 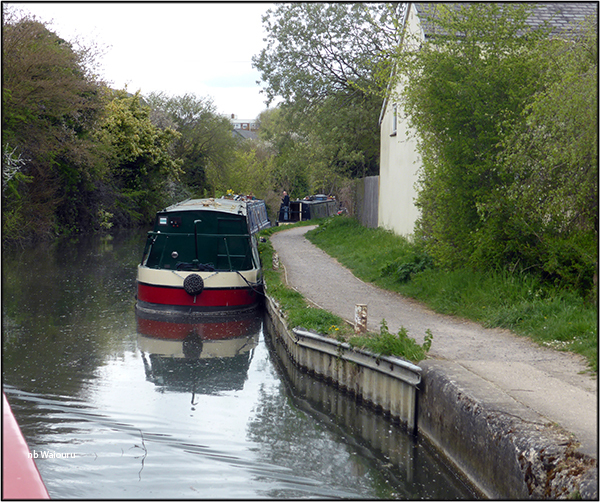 Some considerate boater had moored on the upper lock landing. I guess it saved them having to use pins. 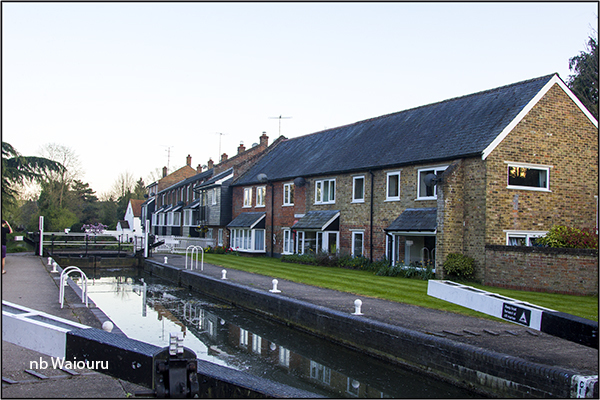 The ground floor level of the lock side cottages appear to be below the water level in the lock. I wonder if they suffer from rising damp? After dinner (the gammon from Denmark was delicious) I went for a walk around the village. This canal side property looked interesting. I think it is probably a former mill. 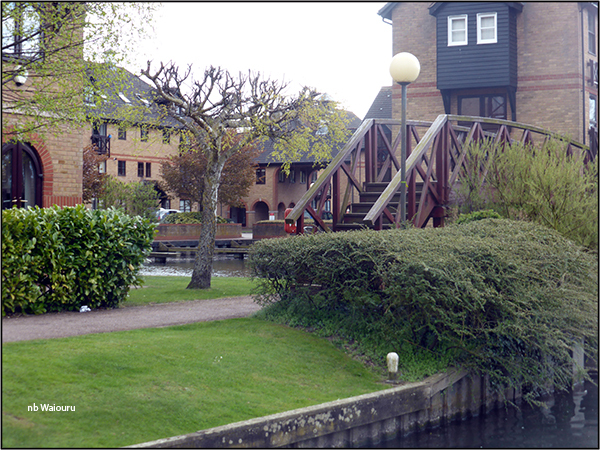 To the immediate right of the above photo is what appears to be a former mill race. By now it was going on dusk. No requirement for me to look for a dessert tonight as I must have swallowed more miggies than all the local fish walking back to Waiouru.